Fun, festive, and flashy—all words that describe this cute little party dress. The Flash of Light Chiffon and Sequin Dress is fully lined. It has pleated chiffon at the top that forms a crossover V neckline. The attached skirt is made entirely of miniature sequins and has a flirty A-line cut. An exposed back zipper completes this sparkly dress. 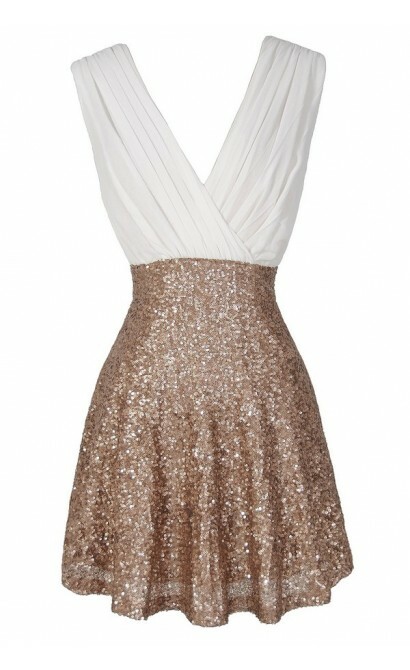 The Flash of Light Chiffon and Sequin Dress would be perfect for any upcoming evening event or holiday party. It would look beautiful paired with pumps or heels and a clutch. This is a great dress that will grab attention! Details: Fully lined. Exposed back zipper. 100% polyester. Dry clean only. Small measurements: Length from top of shoulder to hemline: 33”. Bust: 32”. 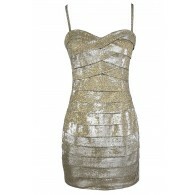 You have added Flash of Light Chiffon and Sequin Dress in Ivory/Gold into Wishlist. You have added Flash of Light Chiffon and Sequin Dress in Ivory/Gold for Stock Notification. 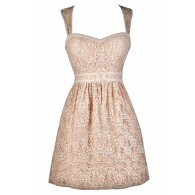 You have set Flash of Light Chiffon and Sequin Dress in Ivory/Gold as a loved product. 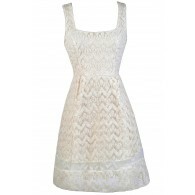 You have removed Flash of Light Chiffon and Sequin Dress in Ivory/Gold as a loved product.